Future's appearance at New York's Highline Ballroom this past Friday celebrated Pluto 3D, a re-release of his major label debut Pluto that features remixes with high-watt collaborators and three new tracks. The new material was originally slated for a free double-mixtape, a plan apparently rethought by Future's label Epic after he emerged as the unlikely jewel of their rap roster, owing in part to the success of Pluto’s fourth single, a ballad posing as a rap song, called “Turn On The Lights.” “[Epic CEO] LA Reid called me and said, ‘Man, Imma give you a whole lot of money,” Future told Billboard in November, celebrating the budget he says the label’s opened up for his sophomore album, due next year. A number of other Epic artists opened the show at Highline, flanked by large cardboard cutouts of Future dressed in a pilot’s outfit. Ca$h Out, a couple months past the glow of his big, self-referencing hit, wafted through mixtape tracks cautiously, with one hand glued to the mic and the other waving through the air as if swatting at flies. Ace Hood followed, his calling card “Hustle Hard” almost as well received as the moment when he took off his shirt. Though he opened the show to a sparse crowd, King L was the most confident of the night's openers, with a comfortable mastery of his playful, tangled lyrics and a joking dance to go along with the catchy “Val Venis.” Afterward, L watched the rest of the show from a balcony where a plushy, stadium-mascot duck, the "fourth member" of WatchTheDuck, a new EDM-tinged rap group, was networking. After a filler DJ set by Hot 97's Funkmaster Flex full of crowd-pleasing if rote repeats (2010's "Grove St. Party" was played three times), Future emerged to "Straight Up," the exceedingly positive ode to his own upward mobility from Pluto. A glittering wallet chain smacked his thigh and he bobbed from one corner of the stage to the next, while one mohawked kid in the front row thrashed in time. The hour-long set that followed offered a nice survey of the abundant output he's created as his star has risen. In between touchstones like “Tony Montana” and “Racks,” Future dolloped in fan favorites that have circulated beneath radio’s radar. He was at his most energized while pantomiming the stacking and chopping of bricks during “Karate Chop,” a melty chant released this fall on a compilation from Georgia DJ’s Pretty Boy Tank and Spinz. “My,” the weirdest of Pluto 3D’s bonus cuts, exposed the difficulties of translating Future’s adventurous recordings to a live setting. On that track, Future screeches the ending syllable of each line with a pinched, pitched-up exclamation. 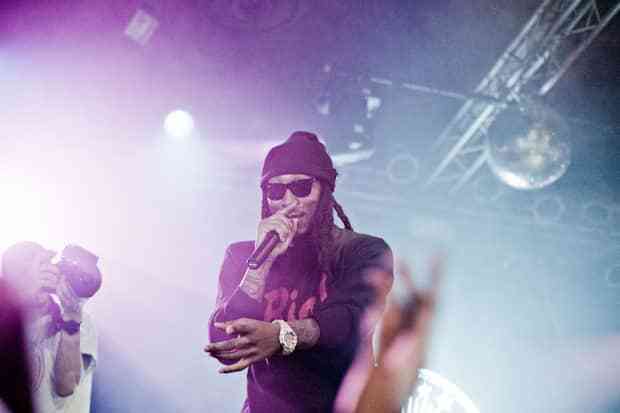 Whether or not those sounds are made possible by Future’s naturally over-the-top vocal mutations or by extra doctoring from producer Sonny Digital, Future was unable to climb that high in the middle of his set, dropping the ends of his words into the thunder of the backing track instead. Delivering all the notes doesn’t feel like the point, though. A Future show is more like a camp meeting than a solo accomplishment, with Future predominantly playing host for people who also enjoy his melodies. College-aged couples in the crowd turned their backs to the stage and filmed themselves making out to the lovveee uhaooah ohhoh tumbles of “Loveeeeeee Song,” Future's new collaboration with Rihanna. A slightly older, single woman accompanied by friends spent the entire set standing atop one of the venue’s bar booths, mimicking the pointing at the sky happening onstage. Future appeared as tuned-in as anyone else, incessantly jumping as if standing on a pogo stick, doing his part to cheer the beats along. It looked like good exercise.